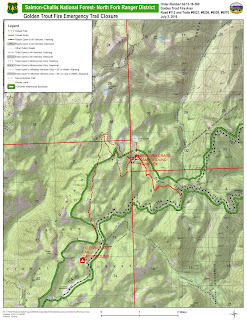 Salmon, Idaho: The Salmon-Challis National Forest has closed a portion of the Anderson Mountain road, portions of the Continental Divide Trail, and one entire road and four entire trails today due to the 3 Mile Fire. Closure signs are being posted to inform forest visitors. This closure is necessary to provide forest visitors protection from the current safety hazards associated with the 3 Mile fire. · Anderson Mountain Road (Forest Road #081) and the Continental Divide Trail (CDT) beginning at their intersection with Highway 43 to the end of the Anderson Mountain Road (Forest Road #081). The Continental Divide Trail (CDT) continues south to Big Hole Pass. · Nez Perce Ridge Trail (Forest Trail #6125), beginning at the Forest Boundary to its intersection with the Three Mile Ridge Trail (Forest Trail #6124). · Three Mile Ridge Trail (Forest Trail #6124), beginning at the intersection with Forest Service Road #079 to its intersection with the Continental Divide Trail (CDT). · Forest Road #080 (Forest Road #080) beginning at the junction with Forest Road #079 to its end. · Keystone Gulch Trail (Forest Trail #6123) beginning at its intersection with Continental Divide Trail (CDT) to its end. · Anderson Mountain Loop Trail (Forest Trail #6122.07) beginning from intersection with Keystone Gulch Trail (Forest Trail #6123) to its end. First and foremost, public and firefighter safety is our primary concern. The closure order can be found here: http://bit.ly/29aIUwK. Know before you go. Always check with your local Ranger Station prior to your trip to get the most up to date information on current fire activity, closures, fire danger, and fire restrictions for the area. You are welcome to visit the http://www.fs.usda.gov/main/scnf/home, and check out News & Events, ‘Like Us’ on https://www.facebook.com/salmonchallisnf, and ‘Follow Us’ on https://twitter.com/SalmonChallisNF for further information. 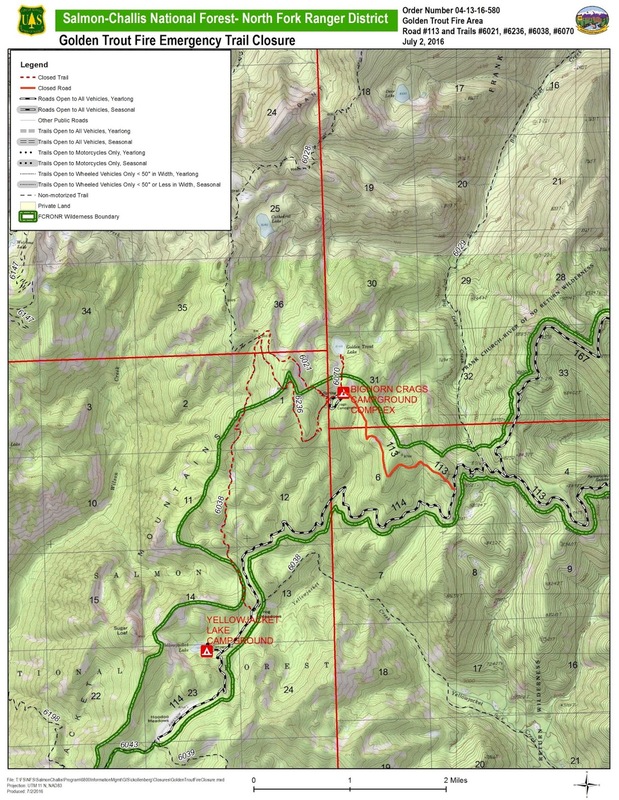 Salmon, Idaho: The Salmon-Challis National Forest has closed a portion of the road to the Bighorn Crags Campground, portions of three trails, and one entire trail today due to the Golden Trout Fire. Closure signs are being posted to inform forest visitors. This closure is necessary to provide forest visitors protection from the current safety hazards associated with the Golden Trout fire. · Bighorn Crags Trail (Forest Trail #6021) beginning at the Big Horn Crags Trailhead to where Bighorn Crags Trail #6021, Upper Yellowjacket Creek Trail #6038, and Crags Horse Alternate Trail #6236 come together. 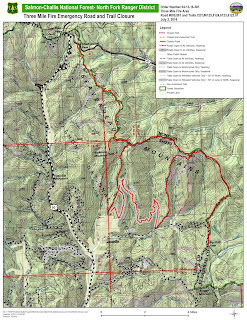 · Crags Horse Alternate Trail (Forest Trail #6236), beginning at the Big Horn Crags Trailhead to where Bighorn Crags Trail #6021, Upper Yellowjacket Creek Trail #6038, and Crags Horse Alternate Trail #6236 come together. 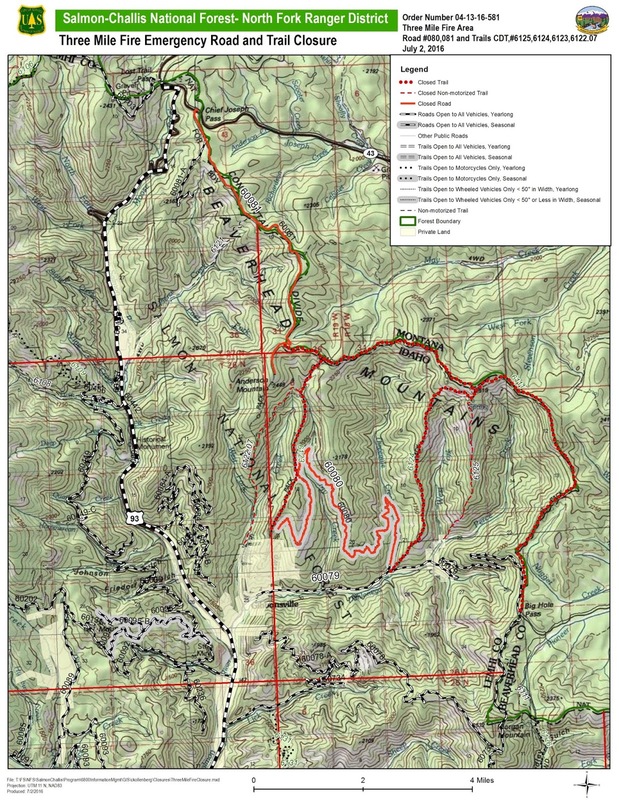 · Upper Yellowjacket Creek Trail (Forest Trail #6038), beginning at the intersection of said trail and Forest Service Road #114 to where Bighorn Crags Trail #6021, Upper Yellowjacket Creek Trail #6038, and Crags Horse Alternate Trail #6236 come together. · Golden Trout Lake Trail (Forest Trail #6070) beginning at the Bighorn Crags Trailhead to Golden Trout Lake. · Bighorn Crags Road (Forest Road #113) beginning at its intersection with Forest Road #114 to the Bighorn Crags Trailhead. First and foremost, public and firefighter safety is our primary concern. The closure order can be found here: http://bit.ly/29duJp8.